The McCabe Funeral Home began in February 1972 when Howard S McCabe purchased the former D.Paul Wilkinson funeral home in Ligonier. Howard and his family moved from Pittsburgh after working with the T.D. Turner funeral home for 27 years in Wilkinsburg. Then, in 1975 Howard s son John joined him and opened his own funeral home in Derry. 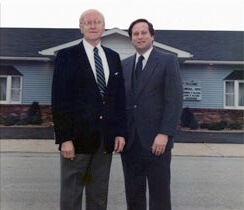 After purchasing the Clayton E Linsley funeral home in 1975 John rebuilt his funeral home in 1983. Howard S McCabe died in November 1987, John continued to run the family business in Ligonier until 1997. The John McCabe funeral home continues to serve Derry after 35 years of family owned operation.